World’s Fastest motorbike Crash to survive from…! | Racing | Eisenberg Racing - Max Your Life. World’s Fastest motorbike Crash to survive from…! The weekend of 17/18th Sept 2016 was a day that will never be forgotten by many at Elvington. 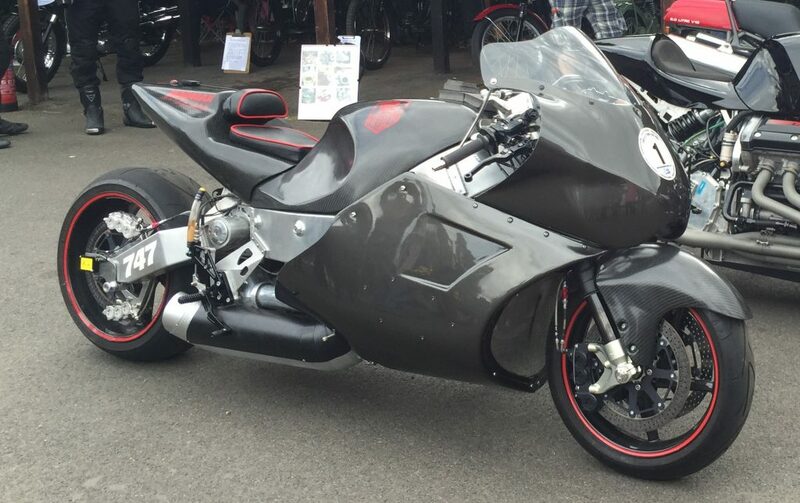 The MADMAX Turbine bike was in perfect health with a new C20B turbine delivering maximum horsepower, but conditions of the day were very windy, but luckily a tail wind. Saturday the 17th was going well, with good speeds of circa 230mph plus. As this was a 2 way average FIA/Guinness record event, the pressure for everyone was far more, as you needed to do a maximum speed ride, down runway 26 and then do a maximum speed in the opposite direction. All within 1 hour, with no changes being allowed other than, fuel, water and a battery charge. Sunday the 18th was looking good in the morning, till about 1pm, where weather forecasts were not looking ideal, with strong cross winds forecast, which make fast racing very dangerous. I was rushing to get the bike out and back within 1 hour, before the wind turned straight across the runway, which would have brought an end to the days racing. On the second run, I was rushing to keep within the good wind conditions and and my data guy forget to reset the ‘brake at 1 mile’ flashing red warning sign on the dash. This is very important, as on a naked bike (no fairing at all), the wind resistance is extreme and your eyes go blurry at circa 230mph. Your peripheral vision also narrows from quite wide to a sniper rifle scope, so the massive black/white chequered finish boards on either side of the course disappear from view. I nailed the throttle to the finish line, approaching 240mph, but was not aware if I had gone through the finish line or not, as I did not see the finish boards (out of sight from my vision). I thought to avoid having to abort and do both runs again, I would hold full power for a few more seconds. However at 230mph + you are doing about 400 feet per second. So three seconds is 1200 feet! Within a flash, I could see the end of the runway grass, which I was approaching at speeds of 230mph. My life flashed through my eyes, what do I do… ?? If I slam the brakes on, I will come off and slide down the concrete runway at 230mph, ripping leather, skin and bone off my body. If I hit the end without braking, and stay upright I may go to heaven in one piece and may be a useful organ donor!? I decided for the latter. From now on, I remember nothing, other than a bright flash of light, followed by a calm lovely feeling with beautiful blue sky and green grass? – Did I briefly enter the other side? From the observers and marshals who where there, this is what I was told. They were shocked that I passed the paddocks at full power and full speed. I hit the end of the runway at crazy speeds of circa 230mph, hit the grass bank ramp, crashed through the bramble and trees, took off like Evil Kneival, cleared the metal and barbed wire fence and landed 100ft away in the grass field, front wheel first. The bike disintegrated into pieces with bits flying everywhere. I landed some way from the bike, covered in fuel, as the Jet-A fuel tank split open over me. The fuel tank was very strong and made of Carbon/Kevlar, so when I landed front wheel forward, I was forced into the fuel tank. I later learnt this was responsible for shattering my pubic bone, both pelvis blades, hip and femur. Fortunately, as I was not near the bike, the fuel did not combust. The medical crew attended within minutes. I was not breathing and the helmet strap was suffocating me. I had to be brought round and given Ketamine tranquilliser injections, as it looked like I had multiple fractures and the new helmet had a large split in it and was filled with earth. The Helicopter arrived within 10mins and took me straight to Leeds Trauma hospital. My team and the rest of the competitors after examination and clearance collected the bike bits from the fields and put the remains of the bike back in the van to take back to Guernsey. As soon as I landed at Leeds Trauma hospital, which is one of the best A&E hospitals in the country, I was drugged up more with more Ketamine and Morphine. As I was not talking or communicating, I was given a full CT body scan (equivalent to 20,000 normal X-rays of radiation!). They found I had snapped my hip and femur, shattered my Talus bone, ripped the rotator cuff off my shoulder, 3 broken bones in my right hand, 2 broken bones in my left hand, hurt my collar bone, damaged by right elbow, cracked both pelvis blades, snapped my pubic bone and had a dent in my skull, whilst also having reduced sight and vision, due to a negative 25 g deceleration crash. Monday morning, one of the best Hip surgeons in the world flew over from Greece, operated and inserted a titanium hip bolt, femur, 10″ titanium bolt through my pelvis. This was all supported by a carbon fibre and titanium exo-skeleton frame around my hip to hold it all in place. I came around 72 hours later, looking like I had a really bad crash (err… I had!) The news media had gone wild with news stories around the world of a crazy land speed racer surviving the world’s fastest crash on jet bike. The amusing part was, due to the Ketamine, I was in good euphoric spirits, typing away on the computer, oblivious of the broken hand bones, talking to family, friends and journalists. All was well, until they needed to operate and insert three titanium bolts in my Talus bone (ankle). That surgery soon wore of the euphoric effects of Ketamine. After two weeks waiting for my collapsed lung to repair, I was air home to Guernsey Princess Elizabeth hospital, for another operation to repair the rip in my rotator cuff bone to muscle part of the shoulder joint, using bolts and carbon fibre. I stayed three months in hospital, lost 2.5 stone in muscle and went into a deep dark depression. No bike riding, no training and trapped in a bed on my back for 3 months is not very motivational. I did everything I could to maintain my sanity, positiveness, used elastic bands as a form of resistance training and ensured I ate and slept as best I could. I left hospital in a wheel chair, and had to learn to walk again, using crutches for another 9 months. I had a goal to race again within 12 months on the anniversary of the crash, back on a new Jet bike at Elvington on the same day, on the same runway 26… the challenge had been set!